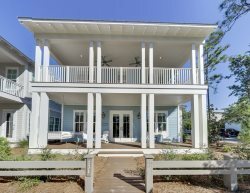 Perfectly Located 30A Vacation Rental Overlooking Green Space + FREE BEACH TRAM SERVICE! '231 Wisteria Way' New Beautiful WaterColor home with Designer Furnishings + FREE BIKES! This five bedroom home is directly adjacent to a large green space and close to the Lagoon pool in Seacrest Beach. Camp David is the perfect 30A Escape! Featuring an open living, dining, and kitchen area, this home is ideal for large families. The living room is a beautiful place to entertain or relax after a long day at the beach. Decorated in creamy neutrals and beachy blues, the living space is a sight to behold. The gourmet kitchen is adorned with stainless steel appliances and a large island that will make cooking on vacation a pleasure. The dining area is a great spot for family meals or for family game night! In the evening, your friends and family can relax on the screened balcony off of the main living area. It has comfortable seating, a large flat screen TV and a table. Also on this level, the 2nd floor, is a king master bedroom with a private en suite. There is a half bath available for your convenience. The master suite, which is on the 3rd floor, has a king bed, luxury en suite and access to a private balcony. The master bathroom offers a large walk in shower and a spacious vanity. This private area is a great place to escape too! On the 1st floor, there is a king master with private bath, a queen guest room and it's own private bath. There is also another bunk room that sleeps up to 10 people! Camp David is the perfect family beach escape! Just outside is a large green space that is ideal for playing games with the kids. Don't forget, Camp David is close to the large Lagoon pool. This home has everything needed for the perfect family vacation. Come stay, play and make memories to last a lifetime! 3) 5 bikes are included in the rental. To utilize, waiver must be signed and received before code provided.